Even though we are big advocates of green living — and even once jokingly advertised a kale-flavored cachaça — when we say that Novo Fogo and shrubs pair wonderfully together, we’re not talking about bushy plants. We’re talking about the drinks known as shrubs that are coming back into style as bartenders raid the past for inspiration. And thanks to Shrubs: An Old-Fashioned Drink for Modern Times, the definitive new book on the subject from East Coast cocktail writer Michael Dietsch, we’re enjoying them more than ever. At the most basic level, at least for the contemporary meaning of the term, a shrub is a mixture of fruit, sugar, and vinegar. Under some older meanings of the word, shrubs were alcoholic beverages made with fruit, sugar, and spirits, or what we would now think of as punches. The etymology traces back to the Arabic word sharab, from which are also derived the words sherbet, syrup, and sorbet. The word “shrub” has taken on many guises over the centuries, but the current vinegar-soaked meaning seems to have stuck for modern drink makers. Shrubs originated as a means of preserving fresh fruit before refrigeration and long-distance shipping made it possible to buy produce at the grocery store year-round. Sugar and vinegar both act as preservatives, so infusing fruit into the two was a way to preserve their flavors at the peak of freshness. They were also popular for their alleged medicinal properties — which may or may not have been helped along by the addition of rum and brandy. In the twentieth century the practice of making shrubs faded out of most homes, with the exception of some traditional communities such as the Pennsylvania Dutch that kept it alive. Dietsch points to a few factors that led to the dying out of shrubs. When Prohibition ended, imbibers were able to more easily acquire alcoholic beverages. Non-drinkers turned their preferences to chilled, bottled drinks like Coca-Cola. And refrigeration made it easier to keep fruit fresh without steeping it in vinegar. As a result, shrubs largely disappeared until very recently. Shrub-making finally revived in earnest in the early 2000s. Dietsch credits a few sources with inspiring this renaissance: the writing of Wall Street Journal drink columnist Eric Felten, bartenders Toby Cecchini and Neyah White, producers like Tait Farm in New York and Pok Pok in Portland, and the generally enthusiastic spread and adoption of new techniques among the internet-connected bar community. Cachaça + shrub + soda = happy times! Cut habanero chili. Wear gloves! Pour into a bottle or jar. Add Silver Cachaça and soda. And now, finally, there’s Dietsch’s own book, which is a rich source of inspiration for anyone wanting to make shrubs at home or in the bar. There are multiple methods of making shrubs, some of which involve boiling the fruit. This is fast, but introduces a cooked taste. Dietsch prefers a cold process, macerating fruit in sugar to extract juice and flavor before dissolving in vinegar. The resulting shrubs are delicious, lush, and richly flavorful. Dietsch provides recipes for nearly fifty shrubs using a wide variety of fruits, vegetables, and herbs, but he encourages experimentation. “Shrub making isn’t like baking, where you need to follow the recipe precisely to ensure perfect bread or cake. Shrub making is more intuitive. You can fly by the seat of your pants and still have something delicious to sip.” As a rough guideline, he suggests using two parts fruit to one part vinegar and one part sugar, but individual tastes may vary. Although cold-process shrubs take some time to infuse, they are easy to make. And it’s worth taking the effort to make them. By doing the work in advance, one ends up with a versatile ingredient that possesses sweetness, acidity, fruit, and whatever additional flavors one might like to add. Combined with a little soda, they make delicious non-alcoholic refreshers. With the addition of a base spirit — cachaça perhaps? — shrub and soda combine to make a wonderfully complex and balanced three-ingredient cocktail. Combine the kiwi, habanero, and sugar in a bowl, cover with plastic wrap, and refrigerate for 24 hours to let the mixture macerate. Once the flavors have infused, strain out the liquid and combine with the vinegar, whisking to dissolve it. If sugar still clings to the fruit, pour the vinegar mixture back through the strainer to capture all of it. Bottle the strained shrub and refrigerate, allowing the flavors to marry for a few days. This kiwi-habanero shrub packs noticeable heat, but it’s delicious over ice with soda. It’s even better with the tropical, grassy aromatic notes of Novo Fogo Silver Cachaça. 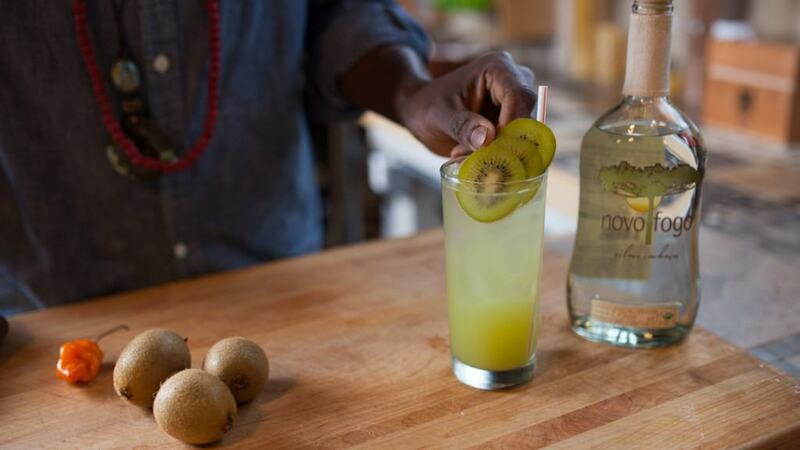 Combine ingredients in a tall glass with ice, stir gently to combine, and garnish with a wheel of kiwi. If spicy habanero is not your thing, Dietsch’s excellent book offers plenty of other possibilities for exploring fresh fruit, sugar, and vinegar. Pick up a copy and see where it takes you. Find Novo Fogo Cachaças near you.